A while back I had a read through the PTV rail network plan looking to summarise their view on the rollout of high capacity (in-cab) signalling. Sorry this post has been so long in coming. This short (three minute) video explains it nicely, but one analogy is that the current system is like driving around the burbs using nothing but traffic lights to determine when to stop or go. This of course would be extremely inefficient — you could only have one car per section of road between traffic lights. So of course we drive mostly by sight, simply keeping a safe distance from the car ahead. For trains, the stopping distances are too long to be able to drive by sight, but in-cab signalling provides the signals inside the driver’s cab instead of trackside, with the system advising how fast the train can go while still keeping a safe distance from the one ahead. Most of Melbourne’s signalling system, known as an Automatic Block system, currently uses coloured lights next to train tracks to advise the driver of what speed it is safe to travel – essentially the same technology introduced a century ago. The signalling capability in the city and inner suburbs, where two or more lines share tracks, typically allows for average two to three minute headways (the time between trains), extending to three to five minutes on each suburban line. Safe distance between trains is ensured by providing a signal sighting / driver reaction time, a minimum breaking [sic] distance and a safety margin. The existing system typically operates at around 15 trains per hour and could operate at up to 24 trains per hour in an ideal operating environment. In reality, a frequency of 22 trains per hour is seen as the practical achievable capacity to ensure an acceptable level of reliability can be attained. In-cab signalling in systems overseas sees around 33 or more trains per hour running, so obviously you get a big benefit from increased rail line capacity — if you’re going from 22 to 33, then that’s around 50% more trains. Coupled with upgrades providing more capacity in each train, you can move a lot more people. So how much do you need to spend to get this big increase in rail capacity? Perhaps not too much actually. The contract, valued at approximately £354 million GBP (approx € 402 million euro / $ 577 million US), is a part of London Underground’s SSR Upgrade Programme (SUP). Bombardier will provide the proven CITYFLO 650 ATC system, its innovative communication-based train control (CBTC) technology, similar to that running successfully on the Metro de Madrid in Spain. Bombardier will equip the 310 km of track line (40 km in tunnels), 113 stations, 191 trainsets, 49 engineering trains and six heritage trains by 2018, followed by a two-year warranty period. This portion of the London Underground is roughly 40% of the size of Melbourne’s entire rail network, in terms of track length and number of trains (but with much less track in tunnels). On that basis, performing the same upgrade for the entire Melbourne network would cost about £885 million GBP, or about A$1620 million. It’s worth noting however that Bombardier and London Underground have scrapped that particular contract, citing incompatible equipment. Obviously it’ll be interesting to see if they can re-let the contract to another supplier for a cost in the same ballpark. The plans are in place… but one of the options must surely be to roll out the new signalling before the rail tunnels, providing a big capacity boost across the network more quickly. Either way, nothing happens until the government provides funding. And at present, they’re a bit busy pouring money instead into the East West tunnel, despite that nobody asked for it. Update February 2015: PTV chair Ian Dobbs: said high-capacity signalling was a “big technical jump – like going from a Tiger Moth to an Airbus 380”. But he said it would give the state the ability to run “more trains, more reliably … closer together”. Update May 2015: The 2015 state budget included funding for a trial of the technology on the Sandringham line. I found myself at a party recently chatting about public transport. Not just late trains and packed trams, but specifically buses. Who said buses aren’t interesting to anybody? It was in the broader context of sustainable transport in the inner-north, but one of the anecdotal snippets was this: one of the people I was chatting to lives in Brunswick and has a friend in the Edgewater estate at Maribyrnong. While she is an avid cyclist (rides every day to work in the university district), when she goes visiting this friend, she inevitably drives (about 15 minutes), because the cycling routes are limited (and not very flat), and it’s not really viable to do the trip by public transport either. For trips like this by public transport, buses are the only option. Inner-city orbital routes like this aren’t going to have trains any time soon, and while there are three orbital tram routes, more are unlikely. The problem is that, as we all know, buses of are the poor cousin in Melbourne. They are often infrequent, and have shorter operating hours than the other modes. While weekend trains typically run every 10-20 minutes, and trams every 8-15, most buses get nowhere near that. For Brunswick to Edgewater you’d be looking at the 508 bus, then the 472. The 508 runs half-hourly on Saturdays and every 40 minutes on Sundays. The 472 runs every 20 minutes on Saturdays and every 50 minutes on Sundays. The time spent actually travelling might be okay, but the mismatch in frequencies means the chances of a good connection between the two are almost zilch. The 57 tram and 402 bus are also in that area, and aren’t too bad most of the time, but aren’t really crosstown routes; they both originate in or on the edge of the CBD. While people will gravitate towards the most usable services (just as motorists often gravitate towards arterial roads and freeways), unfortunately it’s not as simple as merging all those infrequent routes from a vast geographical area into one single frequent service and expecting people to use it. Some consolidation can help, but you still need a usable grid of frequent services, within say 400-800 metres of trip sources and destinations. The patronage growth on more frequent orbital Smartbus services shows there is huge potential for more people to make this kind of trip by public transport if decent services are provided. In fact, one of the orbital Smartbus routes – the Blue orbital – would have just about served the very trip from Brunswick to Maribyrnong we were discussing. The Blue orbital was proposed by Labor, but they never implemented it. The plan — as with the other Smartbus routes — was it would have combined several existing routes, adding in service upgrades, to provide an option for cross-suburban travel in the inner-suburbs, avoiding having to go into the city and out again. My reading of the old maps is that the Blue Orbital would have run from Brighton to Elsternwick (the existing 216/219), then along Punt Road to Clifton Hill (the 246), then west through Brunswick to Moonee Ponds (the 508), then heading to Highpoint and then replacing part of the 223 to Footscray (including just about passing within walking distance of Edgewater) and then replacing the 472 through Yarraville and Newport to Williamstown. If long orbital routes won’t be provided, then at least the existing shorter routes need to be made more frequent and direct. There’s no real reason, for instance, they couldn’t be as frequent on weekends as they are on weekdays. The buses are available. Reform of routes, rationalising and straightening them out to run direct instead of all over the place, would also help run faster more frequent buses — you know, the sorts of services people will actually use. PTV are actually working on such a plan. While they haven’t yet release a plan for bus routes, word is a bus and tram plan is in preparation. As their demand forecast report flags, bus routes will be re-organised into four categories: Smartbus (up to every 10 minutes), Direct (up to every 15 minutes, running along arterial roads), Coverage (hourly, serving local neighbourhoods, and targeted at people who don’t want to walk a distance to high-frequency services) and Inter-town (hourly, connecting rural-fringe areas to outer-suburban Melbourne). This is good. The current bus network is a mess — some areas have frequent service simply because they used to have trams, but terminate short of logical traffic generators; some routes that should be primary connections into major centres take ages to get anywhere because they go through backstreets. 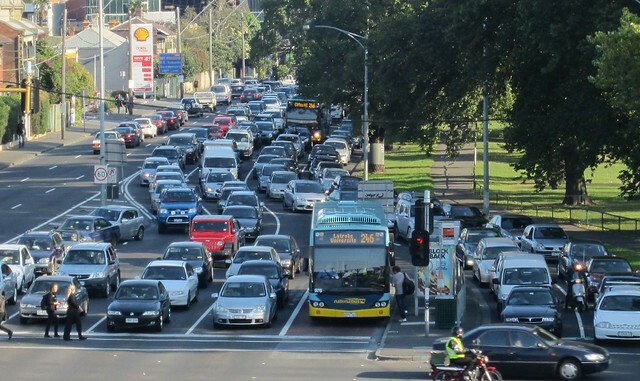 They also need traffic priority measures so they don’t get stuck in heavy traffic, as shown in the Punt Road photo above, where one 246 has caught up to another. Restructuring the network into a grid of more frequent services will help a lot to provide a more usable public transport network overall. And it’s not necessarily terribly expensive. Buses now crawling through suburban backstreets can run more efficiently if they stick to main roads. But some extra funds will be needed. Will they get the money they need? The government’s big push on the East-West link has once again highlighted cross-city transport, but if it gets up, swallowing a decade of transport funding, and the only practical option for many of these trips remains driving, then roads will continue to be clogged. You might recall a while ago I posted about the lack of awareness of $3.50 cheap weekend fares, and frequent (every 10 minutes) trains on some lines on weekends. Well, finally PTV are promoting both. It’s a shame the imagery in the frequent trains ad uses the outer stations’ buildings — likely to be unfamiliar to the vast majority of people along the line. I suspect they’d have done better to use something that more clearly articulated that all the stations along those lines will benefit. Still, hopefully it helps spread the word. The ten minute services are terrific… but we may never see them spread to more routes if patronage doesn’t grow as a result of them. Is there enough promotion of the good stuff in PT? This seems to show that while most are aware of it, some still aren’t, despite having been available in various forms since April 2005 — over 8 years. At $3.50 for all-day travel in zones 1+2, it’s a bit of a bargain, and while price isn’t everything, where the services are half-decent, it can encourage more people to use PT on weekends. I didn’t ask where people are from or where they travel, but it seems few are aware that on the three longest & busiest lines there’s now a pretty damn good weekend service frequency. What these responses say to me is that PTV are still lacking when it comes to promotion. Cheap fares, and trains every ten minutes on the three busiest lines? They should be promoting the hell out of this. As I’ve said before, weekend train services are now better than they’ve ever been, but there’s been hardly any promotion, and what there has been has been so vague as to be pointless. If we’re going to see frequent services on all lines, every day, demonstrable growth in patronage on these first ones needs to be shown. For that to happen, they have to be promoted properly. PTV is meant to be promoting public transport. They do so, but in promoting these two key messages, they don’t appear to be kicking goals. Touch-on Myki at the station then find trains aren’t running? Touch-off again between 30 secs and 15 mins later; you won’t get charged. No time (or no facility) to top-up your Myki Money? As long it’s 1 cent or more, you can make one trip and top-up later. The North Melbourne station to University/Hospital Precinct 401 shuttle runs every 3-6 minutes 6:45am-7:30pm weekdays. I had been writing a blog post about proposed rail lines, and even went to the trouble of drawing a map of what was known about the various proposals floating around. Yesterday a very detailed PTV Network Development Plan for the rail network was released with lots of much prettier and more comprehensive maps. The portents of its release have been there. In the past few weeks, several studies into proposed rail lines have been released: Doncaster, Rowville, and the Airport. The PTV document incorporates these, and lays out how they would build them, and a few more besides. What some people hadn’t registered until now is that the wish list now includes not one rail tunnel, but two. The “metro” (north-south) rail tunnel has been proposed for a few years now — that’s the one leading from the Sunbury line at South Kensington via Parkville, the city to Domain, then to South Yarra to connect with the Dandenong line. The Rowville and Airport studies both conclude that their new lines rely on this for capacity through the CBD. The Doncaster study had flagged the theory that a second tunnel — re-routing the South Morang line from Clifton Hill via Fitzroy and Parkville to Flagstaff — is necessary to provide enough capacity for the Doncaster line to run into the city via Jolimont. The PTV document says this should then extend to Southern Cross and eventually to the new suburb at Fishermens Bend. 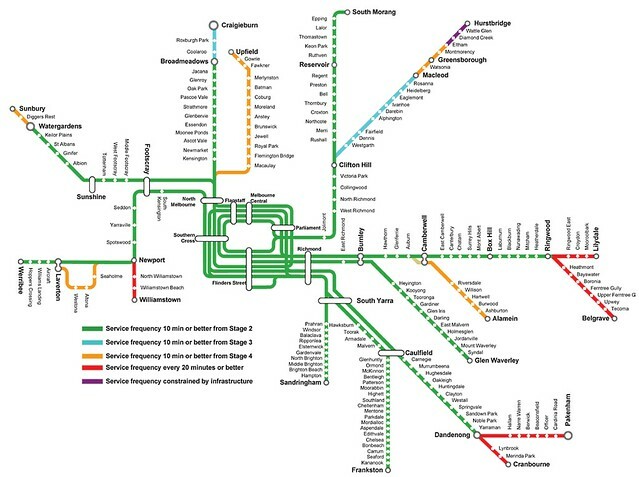 Wishlist maps for the Melbourne rail network are a dime-a-dozen. Every gunzel has drawn one. But it’s rare to see something official, and PTV are to be congratulated for publicly putting out the Plan. Forward planning is essential. Vicroads do it all the time, and put their proposed motorways into the Melway. It’s been lacking in public transport, leading to debacles like the Footscray pedestrian bridge being partly demolished only just after it had been built. And there’s a lot to like in the document. It explains how each project will build on the overall capacity and reliability of the network. The overall strategy is a good one — to move towards self-contained lines, with a minimum of junctions and interactions with other lines that limit train throughput. 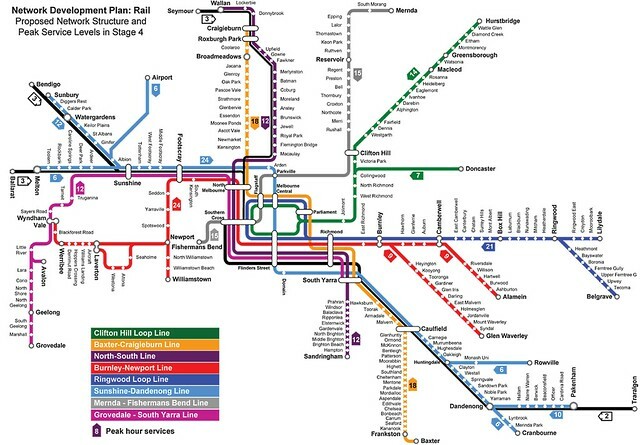 Even stage 1, the 2016 service plan (basically “how do we run the trains once Regional Rail Link is built”), includes some great outcomes for passengers, including seven day services every 10 minutes from the city to Newport, Dandenong, Ringwood, Glen Waverley, Sandringham, Sydenham and Craigieburn (joining Frankston, which already has it). Governments might baulk at the cost of some of the later more expensive upgrades, but those initial service upgrades should be a priority for funding. They bring great benefits for little cost. The Plan also includes things you don’t normally hear about, like modern in-cab signalling systems, which allow up to 50% more trains to operate on a line, for a relatively low outlay. And while it only covers Rail (apparently the Bus and Tram plans will be out later), it does have a section talking about connections between modes, including timetable coordination. There are heaps of good ideas in the Plan. If I have anything bad to say about it, it’s that the running theme with both it and the Doncaster/Rowville/Airport studies appears to be along the lines of: there won’t be enough central core capacity in future year X, therefore we can’t build any new rail lines until the metro and/or Fitzroy rail tunnel have been built first. It’s a kind of innate conservatism in the planning: that new lines have to be built with all possible future growth catered for, and if we can’t do that, we shouldn’t build them at all. This is quite unlike the road lobby, who will happily build virtually anything, knowing that if later growth blows the capacity, it will just provide the political impetus for the next big project (and in the mean time it will still provide some “benefit”). For instance, the Eastern Freeway was built knowing full well it would terminate at Hoddle Street, creating a snarl there. The risk of wanting the multi-billion dollar tunnel before anything else can happen is that if funding for that is delayed, everything else is delayed. In reality, there is scope for building lines and extensions now. Extending South Morang to Mernda, for instance, should be a no-brainer. Dipping a toe in the water towards Doncaster, by building the first, easy bit to Bulleen, would get scores of buses and their passengers out of inner-city traffic. The line to the city would cope for a good few years yet, especially if high capacity signalling was included. The Plan has the Altona Loop duplication waiting until stage 4. It could easily be done earlier. Even much of the signalling won’t get upgraded until after the metro rail tunnel is built — when the signalling would deliver similar benefits in terms of capacity, but years earlier and at a fraction of the cost. The Road Lobby knows all about salami tactics. The Rail bureaucracy need to learn the same strategies. It’d be nice to see signalling upgrades across the most congested parts of the network in the short term. It’s cheaper than building tunnels, and although there’s some complexity in ensuring all trains on those sections have the right equipment, the capacity benefit of up to 50% is obviously beneficial. Whatever the precise order of implementation, the government (and politicians on both sides) need to start pushing these projects. In particular, the current government would do well to remember that they were voted in on the back of public transport issues — not the proposed east-west road which was barely mentioned during the election but somehow has morphed into their top infrastructure priority. As for plans for the rest of our multi-modal network, while the tram and bus Plans haven’t yet been released, let’s hope they’re not too far away… and that they’ve been prepared in tandem with the rail Plan! 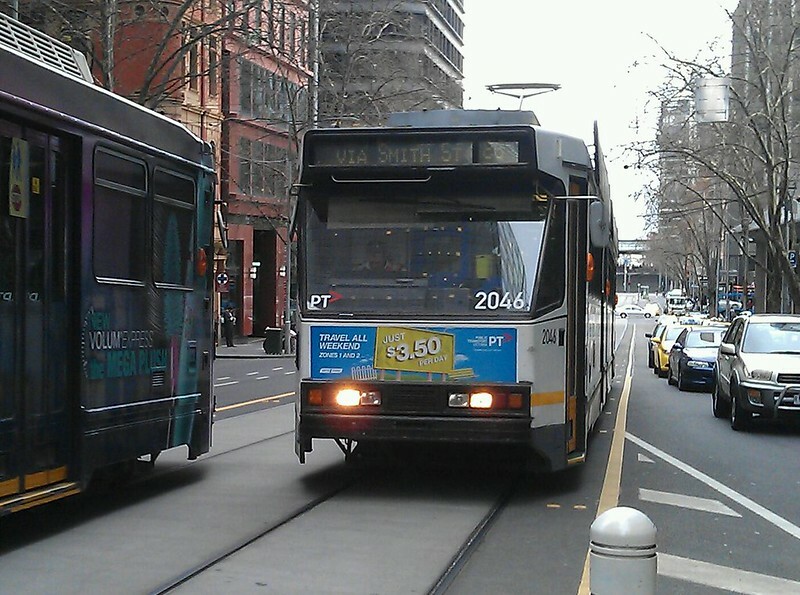 Alan Davies at Crikey: What’s the long term rail plan for Melbourne?